Persistence Market Research offers an eight-year forecast of the global plastic films market between 2016 and 2024. The primary objective of the report is to offer insights on the advancements in the global plastic films market. The study demonstrates market dynamics that are expected to influence the current environment and future status of the global plastic films market over the forecast period. The report also provides updates on key trends, drivers, restraints, value forecasts, and opportunities for manufacturers operating in the global plastic films market. The global plastic films market report is categorically divided into three sections based on market segmentation – by product type, by application, and by region – and provides a comprehensive forecast in terms of value and volume for the next eight years. The report begins with an overview of the global plastic films market followed by an in-depth analysis of the key drivers, restraints, and trends impacting the market. The subsequent sections analyze the global plastic films market on the basis of product type, application, and region and provide a comprehensive market evaluation covering both the present scenario and future prospects. This comprehensive study discusses key regional trends contributing to the growth of the global plastics market and analyzes the degree to which drivers are influencing the market in the five key regions of North America, Latin America, Europe, Asia Pacific, and Middle East & Africa. This report offers business insights on how all applications are contributing to increased consumption in this rapidly growing market. The final section of the global plastic films market report presents a competitive market landscape to provide report audiences with a dashboard view of the various categories of providers, their respective product offerings and portfolios, and key differentiators. Key competitors are identified and evaluated based on in-depth assessment of their capabilities and success in the marketplace. The global plastic films market report provides detailed profiles of leading companies operating in the global plastic films market in order to evaluate their long- and short-term strategies, key offerings, and recent developments. Top companies covered in this report include The Dow Chemical Company, DuPont, Eastman Chemical Company, Evonik Industries AG, Amcor Limited, Berry Plastics Corporation, Griffon Corporation Inc., Mitsubishi Chemical Holdings Corporation, Saudi Basic Industries Corporation (SABIC), and Honeywell International Inc. The global plastic films market report utilizes extensive primary and secondary research to ascertain overall market size, top industry players, top products, industry associations, etc. The report incorporates various viewpoints based on secondary research. Furthermore, data points such as regional split and market split by product type, application, and region; and qualitative inputs from industry experts have been taken into consideration to arrive at suitable market estimates. 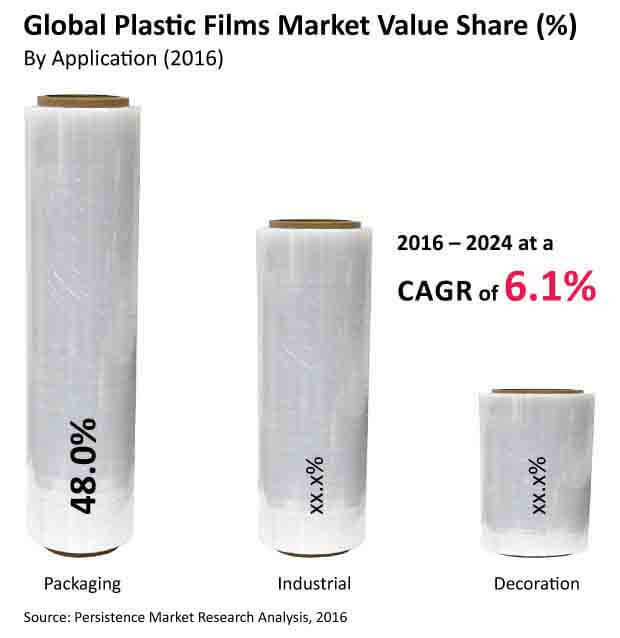 The report begins by sizing up the current market, which forms the basis for forecasting how the global plastics films market is anticipated to take shape during the forecast period. Given the ever-fluctuating nature of the global economy, the report presents forecasts not only in terms of CAGR, but also analyzes the global plastic films market on the basis of key parameters such as Year-on-Year (Y-o-Y) growth to understand market predictability and to identify the right opportunities in the global plastics films market. Another key feature of this report is the analysis of all key segments in terms of absolute dollar opportunity, critical in assessing the level of opportunity that a provider can look to achieve, as well as to identify potential resources from a sales and delivery perspective in the global plastics films market. Further, to understand key growth segments in terms of growth and performance in the global plastics films market, Persistence Market Research has also developed a market attractiveness index to help providers identify real market opportunities in the global plastics films market. Plastic films are thin continuous polymeric material made up of different resins, with each having a unique combination of properties, thereby making it suitable for a unique application. Plastic films are widely used for packaging, labeling, decoration, building construction, electrical fabrication, plastic bags, and industrial purposes. The global plastic films market was valued at US$ 65.65 Bn in 2015 and is estimated to reach a value of US$ 68.79 Bn by the end of 2016, reflecting a Y-o-Y growth rate of 4.8%. Increasing demand for degradable plastic films is expected to drive the overall demand for the global plastic films market. Factors such as employing advanced technologies for decorative laminates, usage of plastic as a substitute for glass and metal, increasing demand for hygienic and flexible food packaging materials, increasing demand for PET, PVC, and PP decorative laminates, and shifting consumer preferences towards eco-friendly products are expected to drive growth of the global plastic films market. Manufacturers in developing countries are focused on product differentiation as they offer varieties of plastic films for packaging, decoration, and various industrial applications. Increasing use of energy-efficient technologies by plastic films manufacturers and rising demand from packaging companies for sustainable and biodegradable plastic films are some of the factors likely to create new opportunities for players in the global plastic films market. The global plastic films market is segmented on the basis of Product Type into PET, PVC, PP, PE, and Others (PS, PA, EVA, etc. ); and on the basis of Application into Packaging (Food Container, Blister Packs, Electric & Electronic purposes, Others); Decoration (Solid colors, Others); and Industrial (Construction materials, Safety materials, Advertisement lighting). The PET product type segment is estimated to gain significant market share during the forecast period (2016 – 2024) and is expected to dominate the global plastic films market in terms of value and volume between 2016 and 2024. The PET segment is expected to register a CAGR of 7.0% during the forecast period. The Decoration application segment is expected to gain significant market share over the forecast period and is expected to dominate the global plastic films market in terms of value and volume between 2016 and 2024. The Decoration segment is expected to register a CAGR of 6.6% during the forecast period. The global plastic films market is segmented into the five key regions of North America, Latin America, Europe, Asia Pacific, and Middle East & Africa. Europe is expected to gain significant market share during the forecast period. The market in Europe is estimated to account for the highest value share of 31.1% by the end of 2016 and is estimated to register a significantly high CAGR during the forecast period. In terms of volume consumption, Europe is expected to account for the highest share in the overall global plastic films market. The APAC market is the fastest growing market for plastic films and is expected to register a CAGR of 6.3% in terms of revenue over the forecast period. The plastic films market in the APAC region is estimated to represent absolute $ opportunity of US$ 716.2 Mn in 2016 over 2015. The Dow Chemical Company, DuPont, Eastman Chemical Company, Evonik Industries AG, Amcor Limited, Berry Plastics Corporation, Griffon Corporation Inc., Mitsubishi Chemical Holdings Corporation, Saudi Basic Industries Corporation (SABIC), and Honeywell International Inc. are some of the leading players operating in the global plastic films market. Top companies dominating the global plastic films market are focusing on offering innovative, customer-centric products and are looking to expand their presence in different regional markets through strategic mergers and acquisitions. Some of these companies are investing in R&D initiatives for the development of new technologies to cater to the rising demand for high quality plastic films.